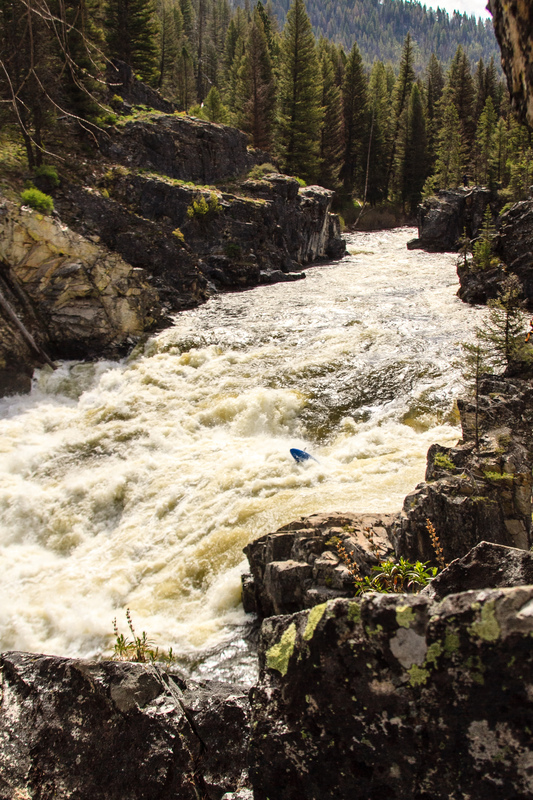 Best known as a classic Idaho multi-day raft trip with difficult-to-get permits, the Middle Fork of the Salmon is an incredible self-support trip with easy logistics, great camping, and consistent, fun whitewater. Middle Fork permits can be booked here, but are subject to a lottery during the controlled season (May 28th-September 3rd). 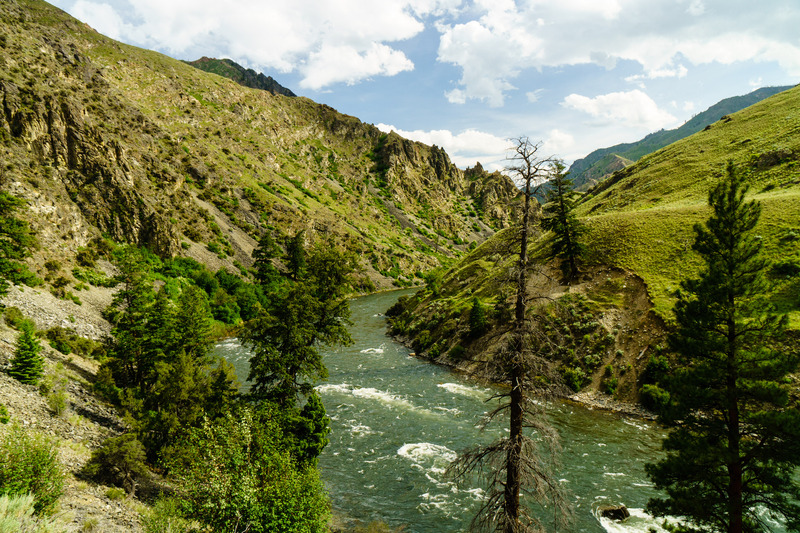 Most people with exposure to western rivers are familiar with the Four Rivers Lottery — Middle Fork, Main Salmon, Selway, and Hell’s Canyon of the Snake. You can try your hand in the regular lottery for permits, but it’s not weighted like the Grand Canyon lottery and your odds for a Middle Fork permit are quite low. For the $6 application fee, it’s worth giving it a go. But don’t count on it. Thankfully — for kayakers — it’s pretty easy to go every year without winning a permit in the lottery. A group of kayakers heading into the canyon below Tappan Falls. The easiest way is to go before the lottery season starts. Outside those dates, the Forest Service accepts first-come first-serve requests for permits on recreation.gov and allows up to seven launches per day, significantly more than during lottery season (three-to-five privates per day). As an added bonus, there are no commercial trips on the river at this time. Under typical conditions, you’ll be able to pull a permit with ease well into May, and often right up to the start of lottery season. In low-snow or early melt years, it can be a bit harder, especially if Boundary Creek Road is open and the river is below 5’. You can book these permits as early as October 1st the previous year — any time in May is usually a safe bet for a trip if you’re willing to kayak in on Marsh Creek (more on this later). The Forest Service has some details about booking permits outside of lottery season here. You can also pull cancellation permits during the controlled season. The system for reserving cancellations has been in flux over the last couple years, so check in with the Forest Service each year to see how they’re handling it. Currently (2018), they’re listing cancellations on the website as soon as they come in, but you’re only able to book them during a two hour window (10AM-12 noon eastern) each day. What this means is that — if the road is open and levels are good — there are probably at least ten other boaters just like you sitting on their computers with three tabs open at 10AM eastern clicking as fast as they can. It can be a bit frustrating, but if you keep at it, you can get a permit this way. More permits tend to be available for the immediate two days, so if you’re able to do a last minute trip that’s your best bet. Cancellations that appear further out are more competitive. The shuttle on the Middle Fork is long. About five hours (one-way). Google calls it six. Setting your own shuttle can make sense if you’re coming from the northeast — Montana — but otherwise, it’s a substantial haul. There are a handful of companies out there that will run your shuttle for you for reasonable fees (very reasonable, if you have a full car). I’ve always had good luck with Central Idaho River Shuttles and Blackadar Boating, but there are plenty of other options too. Most of the companies work like this: you call them, give them your trip and vehicle details, drive to the put-in, stash your keys and payment for the shuttle, kayak to the takeout, and there’s your car! Some even leave you a cooler of beer at the takeout. Looking upstream near Grassy Flat I and II camps. Your paddle and helmet (or cooking pot) can count for the shovel and bucket, but you can’t really get around the other requirements. As of 2017, the Forest Service allows disposable turkey pans (those deep aluminum pans you can buy at the grocery store) as a firepan. I will caution that these tend to disintegrate after a single use. If possible, it’s definitely better to bring a real break-down firepan, or to not have fires every night. Any hard-sided sealable container can pass for an ash container, including a nalgene, plastic bottle, or pelican box. The Forest Service is pretty flexible about groovers. Have some kind of hard-walled sealable container, or the “wag-bag” system and you’re good to go. I’ve used a pelican box before and I’ve used my Grand Canyon-style 2’ long PVC pipe groover. They are ok with a broad range of poop-systems as long as you can show it to them at the put-in. You can purchase Idaho Invasive Species stickers in advance online or at many retail stores including in Stanley, ID near the put-in. They are really serious about checking these stickers. The Middle Fork has an interesting system for camp selection — all groups putting in on a given day meet with the ranger at Boundary the day before at 3:30pm and pick campsites in a draft. The ranger has a list of all campsites being used at all times, so they can tell you which are available and which aren’t. It’s usually a pretty friendly affair, especially early season, but it’s good to be there. If you can’t get to the put-in until day-of, don’t stress too much — there’s plenty of good camping to go around. If you’re launching on Marsh Creek when Boundary Creek Road is closed, you need to stop and check in at the Indian Creek ranger station downstream. You’ll do your campsite selection there and show them the required gear. Which Camps Should I Pick? A big self-support kayak crew at Joe Bump. 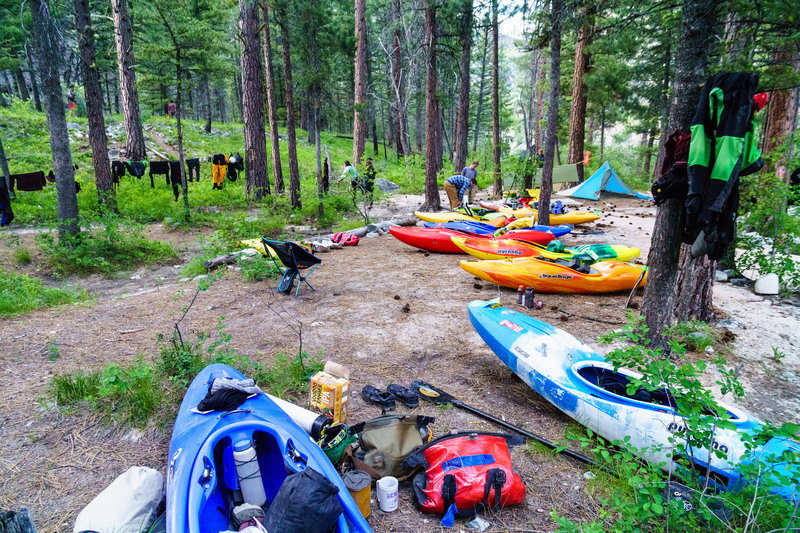 Everyone has their own favorite camps on the Middle Fork. Some simple guidelines can help you make good choices, though. First, you only get one “hot springs camp.” These are camps like Trail Flat, Sheepeater, Scout, Sunflower, Big Loon, and Hospital Bar. They are camps that are located right at hot springs. They’re all pretty nice, but you can also get other camps that are close enough to hike to the hot springs but don’t count as your one “hot springs camp.” These include Joe Bump (above Sheepeater), Lost Oak (across from Sunflower), and Cow Creek (below Big Loon). Joe Bump is a phenomenal camp and Lost Oak is pretty nice, too. Cow Creek is ok. If you’re trying to do some hiking, keep that in mind when you pick your camp. Marble is my favorite camp on the river and has some stunning loops up Marble Creek and over the ridges behind camp. At Big Loon and Camas, you can hike as far up the side-streams as you want. If you’re really motivated, you can hike your boat up and paddle back to camp — Loon Creek has a visually stunning class IV gorge just past the hot springs, and I’ve heard Camas is good too. 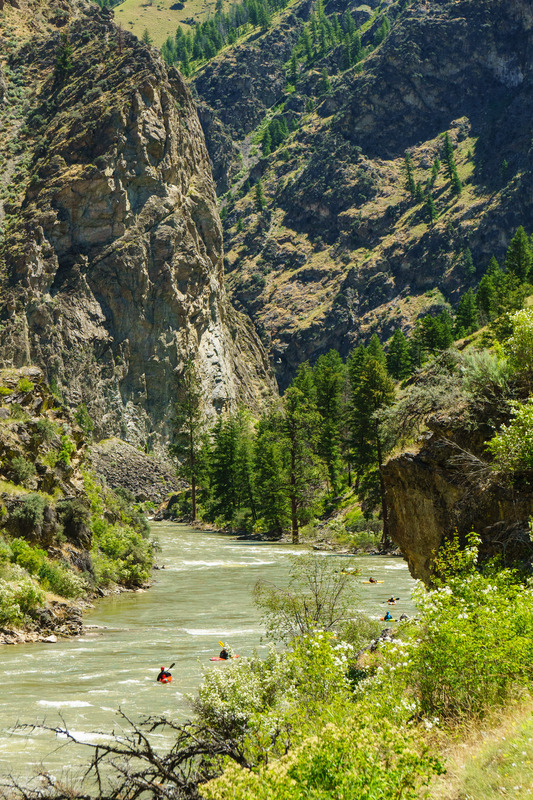 For the most part, you can’t go wrong with camps on the Middle Fork. The free map that the Forest Service gives you has decent descriptions of most of the camps. Consider how you spread your mileage out — it’s fine to have one big day on the water, but time your short days so you can spend more time at the better camps (or at hot springs). What the Hell is Marsh Creek and Why Would I Put On There? If you put in on Marsh Creek, you’ll come to Dagger Falls just before the “normal” put-in at Boundary. There is a well established portage trail through the campground, but it’s also a great rapid if you feel up for it! Marsh Creek is basically the upper Middle Fork — it becomes the Middle Fork shortly before the normal put-in at Boundary Creek. People launch on Marsh for a variety of reasons, but the main one is that it’s accessible via paved road, so when Boundary Creek Road is still closed due to snow, logs, flooding, or whatever, you can still run the Middle Fork by launching on Marsh. For kayakers, Marsh Creek isn’t a big deal, but rafters tend to avoid it because it’s very fast class III and collects wood. If you do float Marsh, particularly at higher flows, be cautious as wood is common and riverwide logjams or snow-bridges are not out of the question early season. This is the easy part! Float the river, relax, and enjoy! Unless you’re doing a marathon one or two-day trip down the Middle Fork, don’t rush — the river moves fast and there’s loads of time. On a recent trip, with levels between 5.5’ and 6’, we averaged over 9mph for the entire trip, and we weren’t paddling hard. Stop at a few hot springs, maybe go for a hike, and treat yourself to a long, life-styling riverside lunch or two! This Middle Fork guidebook is a great on-river reference to use. This map contains the put-in and take-out coordinates and a sample itinerary for a 4-day trip with flows ranging from 5.5′ to 6.25′.